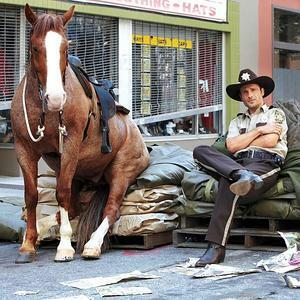 TWD - Behind the Scenes. . Wallpaper and background images in the The Walking dead club tagged: the walking dead season 1 2010. This The Walking dead photo contains lippizan, lipizzani, lippizaner, lippizani, wrangler di cavallo, wrangler, and cavallo wrangler. There might also be ippovia, horse trail, cavallo da sella, equitazione, montare, cavallo di guida, montaggio, and packhorse.